The current parking lot next to the University of Ottawa Heart Institute on Ruskin Street could see a new two-storey parking garage that would accommodate up to 700 vehicles. 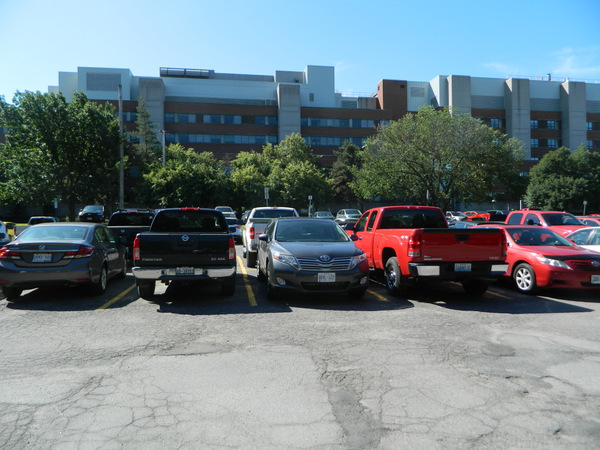 Amanda Farris and her fellow Civic Hospital neighbourhood residents are currently working with city and hospital officials to come to a solution over a two-storey parking garage at the Ottawa Hospital Civic Campus. If approved, the parking garage would start construction before the Ottawa Heart Institute’s expansion, which is set to take place in 2014. Farris says a meeting was held in late June where residents learned more about the project at 45 Ruskin St., which would see the parking lot increase from 270 spaces to about 700 spaces. Some residents voiced their opinions on the project – which included concerns over traffic. Parkdale Avenue is already at capacity during peak periods, Farris says, and Ruskin and Melrose residents are concerned about their streets becoming extensions of the campus. At the meeting, residents voiced their concerns for children and the elderly in the neighbourhood as well as cyclists’ safety. “Our solution would have to address the traffic,” she says, adding that she would like to see Carling Avenue as the major arterial into the Ottawa Heart Institute. Carling Avenue would make sense, she says, especially since it runs right in front of the Ottawa Hospital’s Civic campus. While the Carling Avenue option might add cost to the site plan, the community association says it’s an option that is in the best interest of local residents and commuters who use Parkdale Avenue to reach the Highway 417 on ramp. Farris adds that the proposal came as a surprise to residents at the June meeting. Long-time Civic Hospital residents remembered an agreement between the City of Ottawa, the hospital and residents that was reached in 1996. That agreement says the current 270-space parking surface would remain that way until 2025. On July 9, the City of Ottawa’s Finance and Economic Development Committee also held a meeting to discuss whether they would recommend that city council approve the 16-year lease to the Ottawa Hospital. The lease, which has an option for an additional 15 years, is based on the building of the parking garage. While there are concerns in the neighbourhood over the proposal, and some opposition, she says it is important that the city, hospital and neighbourhood continue to communicate and come to a solution that all parties can agree on.